Janet Collard, Christy Funsch, Sonsherée Giles, Shinichi Iova-Koga, Peiling Kao, and Amy Lewis present choreography to Six Suites for Unaccompanied Cello by J.S. Bach. Music performed live by Jim Kassis, Alex Keitel, Suki O’Kane, Crystal Pascucci, Eli Wise, and Katrina Wreede. Weston Olencki, Helen Newby and Bethanne Walker perform premieres by Dan Tramte and Santiago Diez-Fischer as well as music by Matthias Kranebitter and Chris Swithinbank, with a new arrangement of Michelle Lou’s untitled three part construction for trombone + two performers + objects. A Korg-based micro modulations on a carrier-surge of pummeling beats, will reach your eyes in time, just from the far side. Convergence of concrete-core tape manipulations and total 80’s japan worship. No angst, mostly boogie woogie. Japanoise to abstract expressionism, contents highly volatile. Handle at your own risk. Greh Holger (Hive Mind, Pure Ground) and Lee Landey (Oil Thief, Wand) synthesizer compositions, incorporating rhythm, melody and field recordings. Forging a hybrid territory of installation art, sonic structures, and live concert music, Weston Olencki presents two long-form works by Timothy McCormack and Michelle Lou. Saxophonist Rent Romus’ visionary group Life’s Blood Ensemble presents the album release performance of Rising Colossus, a milestone project of musical exploration of emergence and multiple movements. Source: LEO Weekly. Brotzmann is discussed in anticipation of his Louisville show tonight. Legendary German improvisational saxophonist Peter Brötzmann returns Friday to Dreamland with a different lineup than his 2014 Louisville premiere, bringing with him this time a quartet rather than a trio, with Steve Noble on drums, John Edwards on bass, and Jason Adasiewicz on vibes. He has a remarkably broad discography, going back to the 1960s, with recordings ranging from unaccompanied solos to the large ensemble the Globe Unity Orchestra. It is rare to see someone of Brötzmann’s stature and reputation come to town. 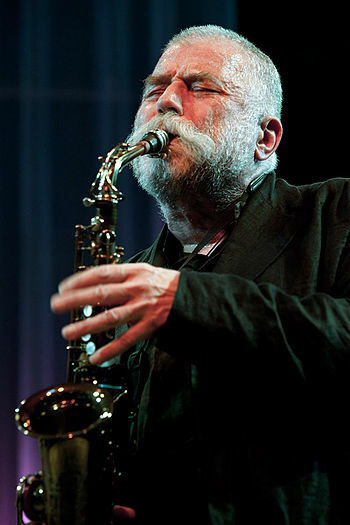 The avant-garde branch of jazz is rarely featured in concert here, so the opportunity to experience Brötzmann’s unique and provocative music in such an intimate setting should be relished by all who seek something different in their listening.